You don’t see a lot of hot-rodding once you arrive at the c-suite level of cars. Sure, over the years Alpina and Hartge have rubbed on some BMW 7-series, and AMG has certainly wafted their magic wands over the occasional Mercedes-Benz S-class, much to the joy of every Miami drug dealer in the 1980s. But what about those overdressed Volkswagens from Ingolstadt, better known as Audi? Most of the better known Audi tuners concentrate on the smaller models, up to and including the A6. Not a lot of them focus on the largest grille to carry the four rings. Audi themselves treated the A8 to the mighty W12 engine, though we in North America never got them. We got the S8, which wasn’t a bad consolation prize. Back when the A8 was still known as the V8, there wasn’t much outside of Treser (remember them?) for the big Audi fan. Today the pickings are better, but not every month is there an A8 centerfold in the big eurotrash buff books. 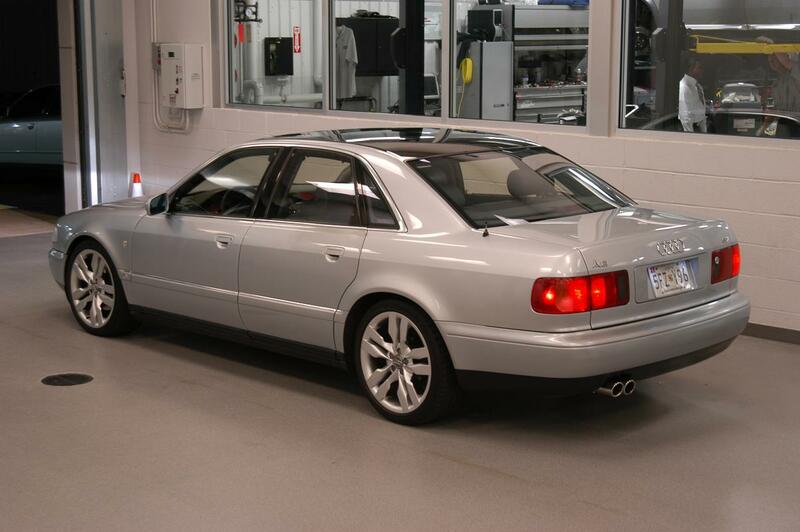 So when a tastefully modified 1997 A8 at a paltry five-large comes online, we at TTS sit up and take notice. When it has a mean stance and gorgeous 19-inch wheels sourced from a late-model S8, we have to adjust our trousers. The wheels aren’t the only mods. The car wears Suspension Techniques coilovers and HID headlights. The outside of the roof has been sprayed black and carries the Solar Sunroof option, and the inside of the roof has been treated to an Alcantara retrim. Interestingly, the former only became an option in 1999, so this was possibly retrofitted. The silver paint shines, especially around the cracked front bumper, and the grey interior looks downright posh, indicating the 148k miles on the odometer are probably about right. “Ooh, yeah,” you say. “148k on the clock? Isn’t that about the time an Audi, especially one with an automatic, starts to completely unravel?” Normally, yes, but the seller lists all the work performed in the last 3,000 miles, and it is not insignificant: four-corner brake pads and rotors with fluid flush; transmission rebuild and new torque converter; full front suspension/tie rod replacement; full timing belt service; most if not all of the oil seals that puke on any modern multi-cam Audi powerplant. 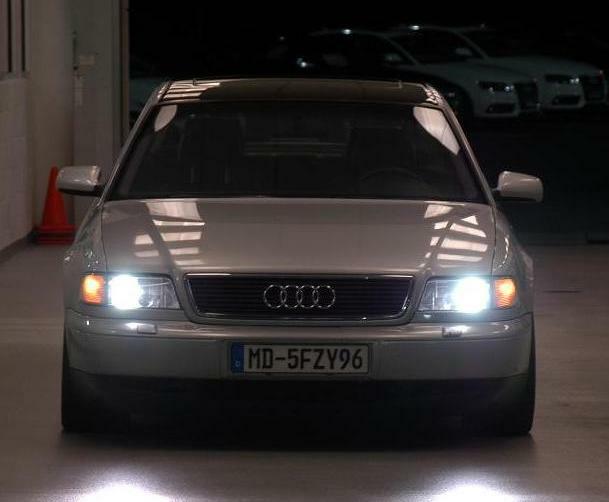 Still, it’s probably not a complete coincidence the photos were taken at what appears to be an Audi service center. My cohort on this blog recently lost a very good friend, Stu Hammel, a man I knew casually but still liked quite a bit. Stu had both an S8 and an A8 in his time. 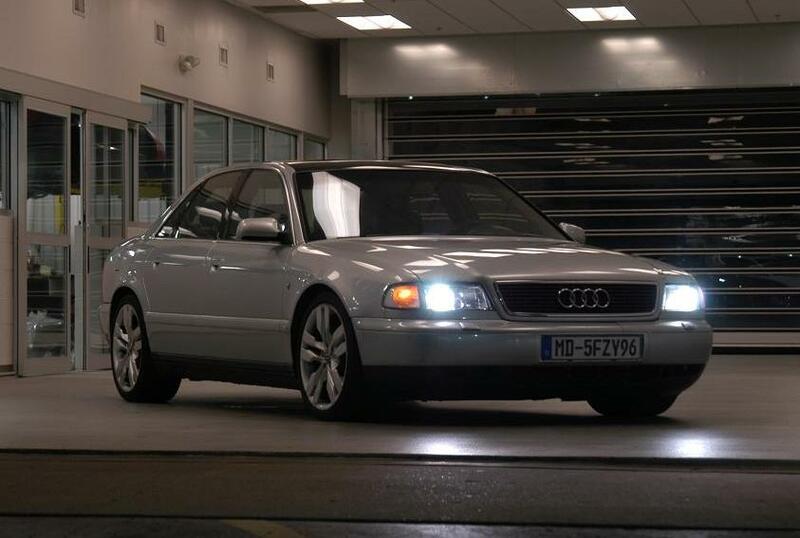 He loved the A8 as a long-distance road car, less so the S8. He said the gearing on the S8 was wrong; it was quick but not fast, and the cogs made it a loud and thirsty highway cruiser. By comparison, Stu’s A8 was perfect for swallowing long miles in a quick and efficient manner. I’ve wondered what a combination of the two would be like. Wait a minute. The badge on the trunk says “3.7” and not “4.2”. There’s no script under the 3.7, and there shouldn’t be, because 3.7-liter powered cars were only front wheel drive. A rare car, to be sure, and probably for a reason. No quattro. No unstoppable snow beast. No… Audi. This entry was posted on Sunday, January 8th, 2012 at 12:40 AM	and tagged with A8, Alpina, AMG, Audi, BMW, Mercedes-Benz, S8, Treser and posted in The Kitchen Sink, Totally That Stupid. You can follow any responses to this entry through the RSS 2.0 feed.